Good afternoon bloggers and gentlemen, after yesterday I gave a Microsoft Visual C + + 2005 Express Edition, today I will memberilan download link Microsoft Visual Basic 2005 Express Edition Offline Installer. Just as Microsoft Visual C + + that I gave yesterday, I gave the file format is shaped. Iso that you can open it with Daemon Tools. Haduwh, speaking about the daemon, so kepikiran to provide a download link as well, maybe tomorrow I will also provide a download link newest Daemon Tools. In order to increase the page download IT Programmer which will be useful also to you who visited the IT Programmer. 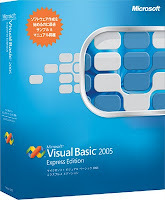 Microsoft Visual Basic 2005 is a new version of Visual Basic 6.0. Many changes are displayed in this new version, from the view menu as well as some changes in syntax. Frankly, not master IT Programmer Visual Basic, because the campus is also not in ajarin about Visual Basic, but I was able to make a simple program to learn the results of self-taught.